Woke late, 8:30! Had a night full of many dreams and good sleep. It was welcomed after my somewhat lack of sleep recently. 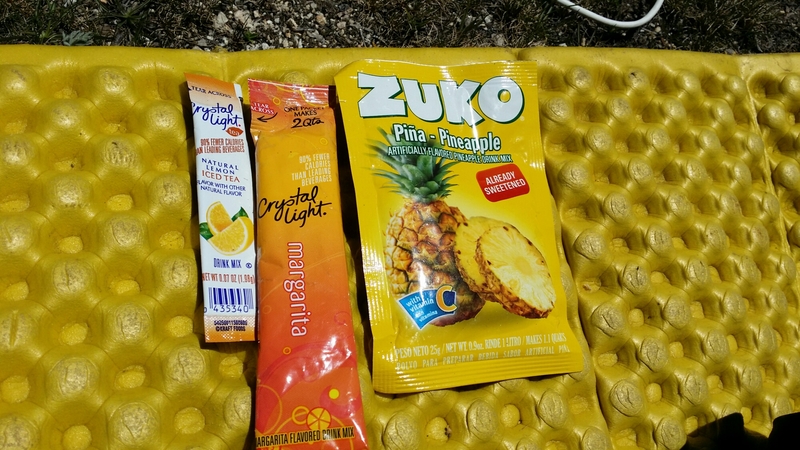 Hiked over Pinchot pass and we took a lunch siesta on a bluff over a lake at 808.5 where I decided to lay out some of the drink mixes I carry to explain that. Though the breakfast essentials I do cold (I double them up and make a shake). Sometimes I do them with coffee or mix with hot chocolate also, they are handy. 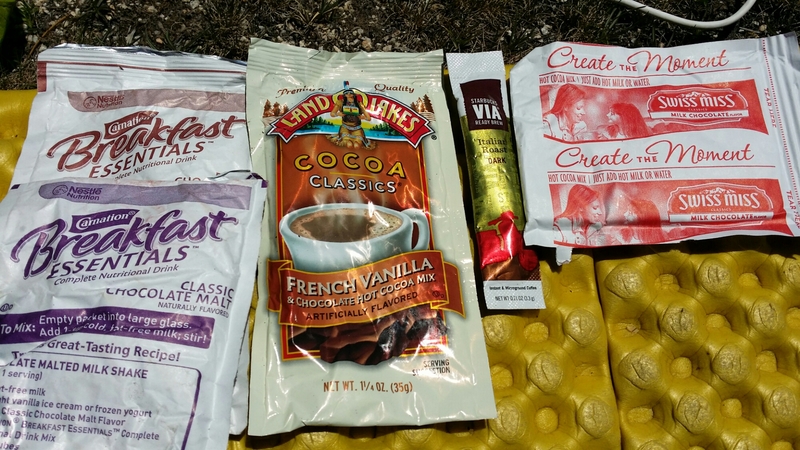 The Starbucks via packages have made coffee while hiking enjoyable, I really enjoy them,. I will also carry a resealable bottle of “Le Lecha sweetened condensed milk” to add to it, which gives me coffee with cream and sugar, I also use that if I bring grape nuts. Mather pass sucked, easy going up on the south side but the descent on the north was treacherous and I lost the trail and post holed and almost fell into some rocks. Not fun, though that is the last dangerous one, apparently. Hopefully. I am camping about 2 miles down fro where this picture was taken. (Waffles hiking in the pic). Nice to be in camp, after hiking up two passes I am beat. Pasta side, some hot cocoa and the day is all good. 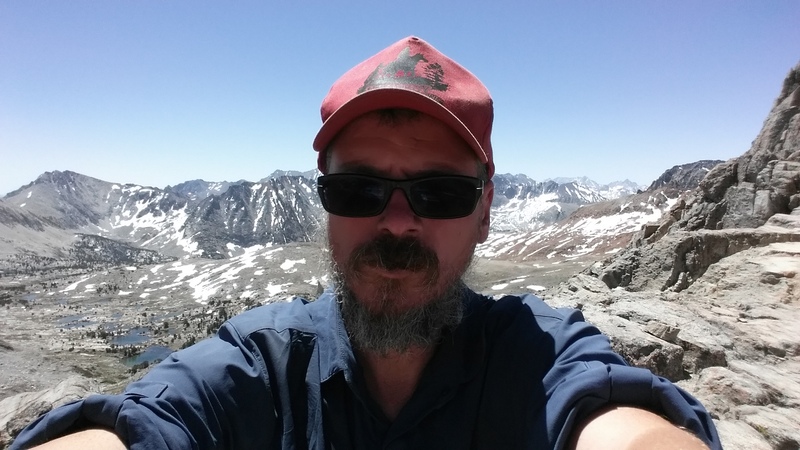 Tomorrow we camp before Muir pass. 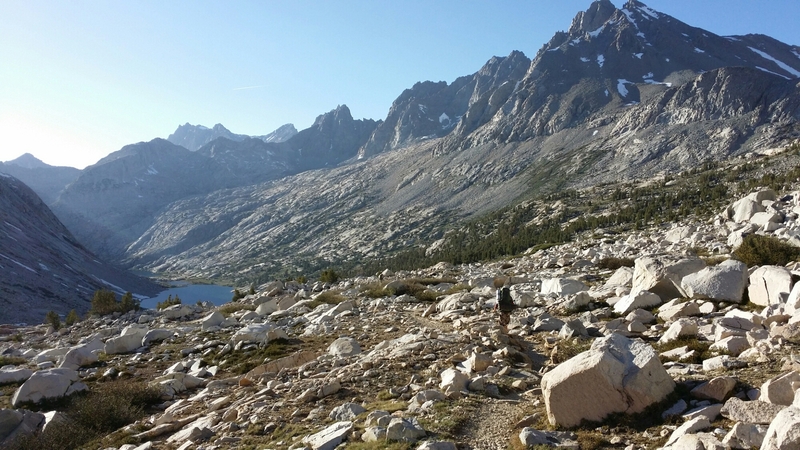 Just a few days to Mammoth Lakes. The Sierra is fun but exhausting.